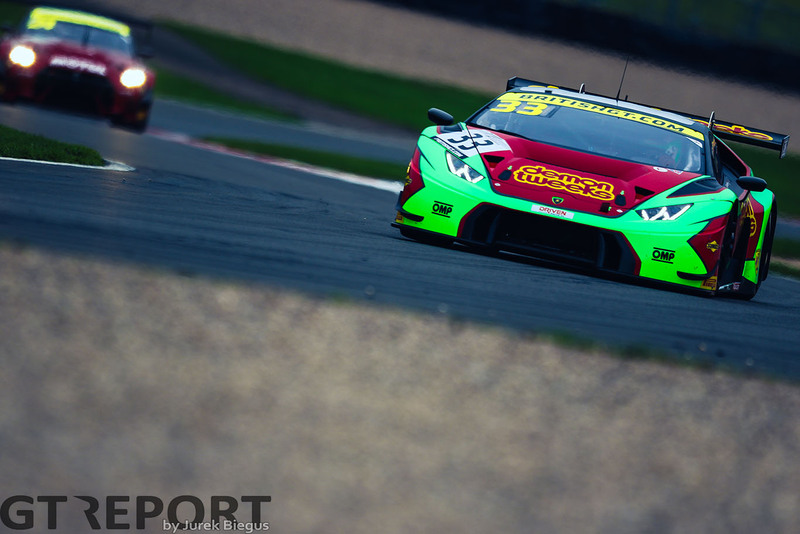 Barwell Motorsport’s Phil Keen and Jon Minshaw took an early advantage in the British GT championship battle as the pair secured a dominant pole position at Donington Park. 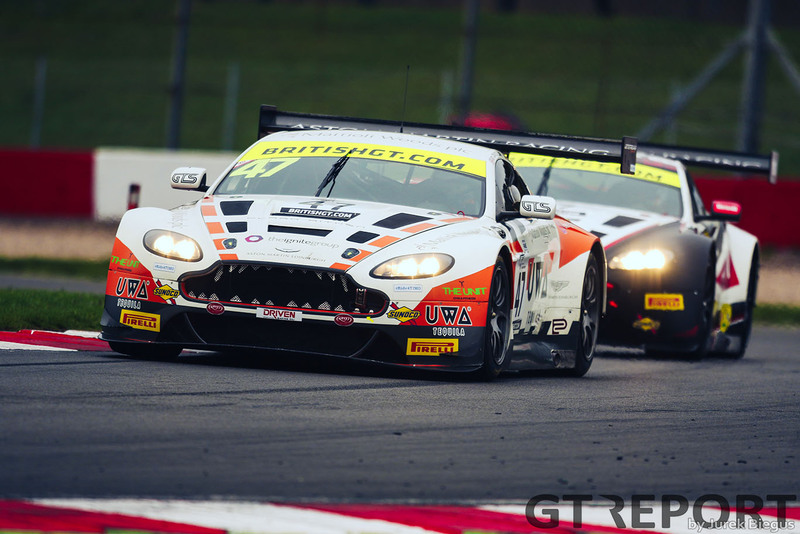 In GT4, Ben Tuck and Ben Green stole an early march in their own championship fight. In wet/drying conditions, the Lamborghini Huracan GT3 drivers were uncatchable as Minshaw set the fastest time in the Am section of qualifying – 1.2sec faster than Graham Davidson in the Jetstream Aston Martin. When Keen got behind the wheel in the 10 minute Pro session, he quickly hammered home the pair’s advantage setting the fastest time in the session – a 1m39.292. Combined, the pair were almost 1.7sec ahead of the rest of the field. Their closest rival was the second Barwell entry of Sam De Haan and Jonny Cocker. 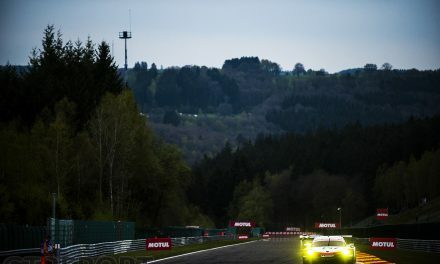 Locking out the front-row, the pair emphasised the advantage the Lamborghinis had in the greasy conditions as De Haan went third-fastest in his session and Cocker claimed the second-fastest time in the second part of qualifying. 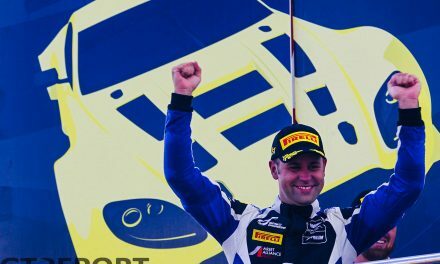 Davidson qualified third, with co-driver Maxime Martin, as the duo quickly established front-running pace in the V12 Vantage – the Scot defying a slight lack of experience of the Aston in the tricky conditions to put in the second-fastest time. Another Aston Martin was fourth, as championship leaders Flick Haigh and Jonny Adam kept in easy striking distance of the pole sitters. 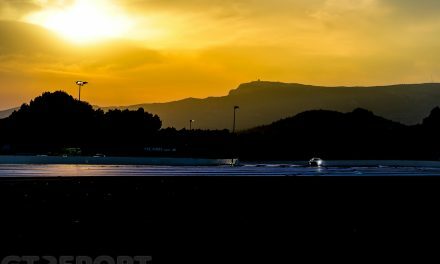 The two TF Sport Astons of Mark Farmer/Nicki Thiim and Derek Johnston/Marco Sorensen rounded out the top six in a good show of performance from the Vantage – which will be replaced by Aston’s new GT3 Vantage for the 2019 season. 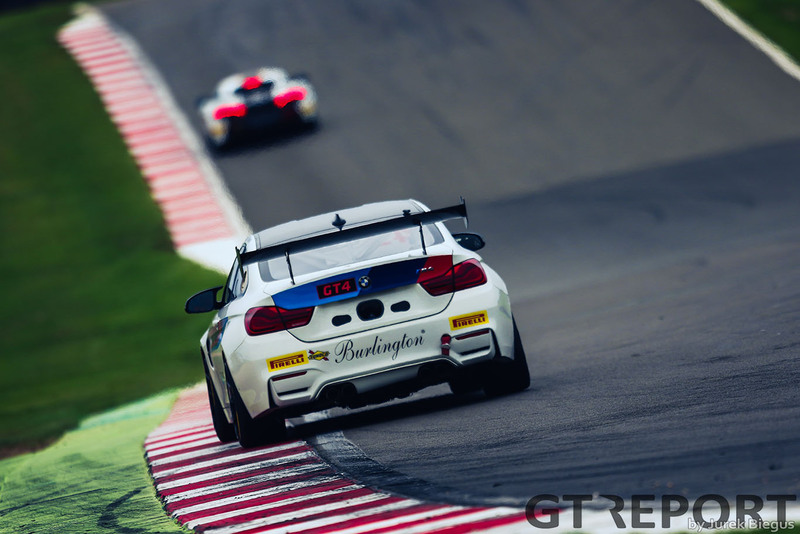 GT4 pole went to the Century Motorsport pairing of Tuck and Green in a BMW M4 GT4. The pair, 10 points behind team-mate Jack Mitchell in the drivers’ standings, combined perfectly to take the early advantage in their battle for the title as Mitchell could only qualify seventh alongside Dean Macdonald. For Green, pole position has given the pair a boost as they look to overturn a points deficit. Speaking before qualifying, Mitchell told GT REPORT that he isn’t thinking about the title ahead of Sunday’s two-hour race. “I think the idea is to treat it just like any normal weekend. Obviously, the championship is at the back of my mind but I think our goal this weekend is just to have a nice, consistent weekend and have a good points finish which should hopefully get us the title,” he added. Second in GT4 went to the Equipe Verschuur McLaren 570S of Dan McKay and Finlay Hutchinson. The pair were provisionally on pole, but McKay couldn’t match Tuck’s late lap. Behind them, was the McLaren of Charlie Fagg and Michael O’Brien. The title contenders had initially qualified sixth after a number of Fagg’s laps were deleted. However, after the session his fourth lap was reinstated and the pair jumped up to third. 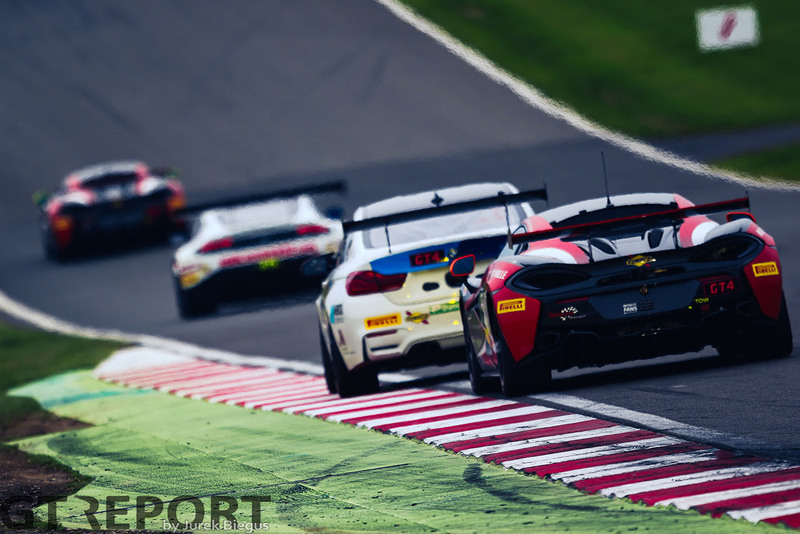 The Balfe Motorsport McLaren of Adam Balon and factory driver Ben Barnicoat finished fourth as the pair returned to the championship having skipped Brands Hatch. In fifth are championship outsiders Matt Nicoll-Jones and Will Moore in the Academy Motorsport Aston Martin V8 Vantage. Team-mates Tom Wood and Jan Jonck are sixth. 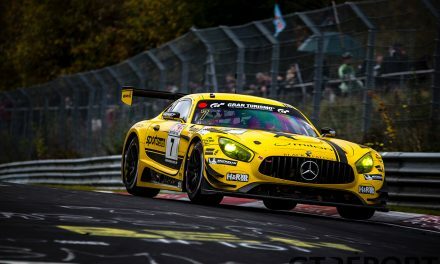 In the Pro/Am championship battle, the Team Parker Racing Mercedes-AMG GT4 of Nick Jones and Scott Malvern qualified in eighth – six places above the UltraTek Team RJN Nissan 370Z of Kelvin Fletcher and Martin Plowman.